The Boystown ATM Bandit has struck again, taking an unknown amount of money from yet another cash machine along the LGBTQ bar strip. Police were called to Progress Bar around 6:30 on Wednesday evening after an employee noticed the burglary. 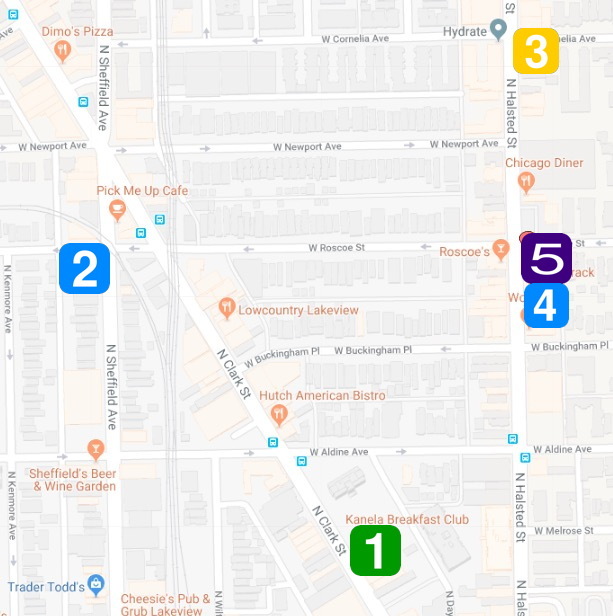 It is at least the fifth ATM targeted in Boystown and the nearby area since April 13. Map of known ATM heists in the Boystown area. Around noontime on May 11th, a witness reported seeing a door pried open and a man running from the scene at Tulip’s Gallery, 3459 North Halsted Street, police said. Responding officers found the backside of the store’s ATM pried open with cash strewn across the floor. The man who was seen running from the area was described as white, mid-30’s, 5’6” tall, and wearing a flannel shirt. Less than an hour later, Venicci Pizza at 3343 North Halsted reported that its storefront ATM had been burglarized. The first known incident in the pattern was reported on April 13th when Kanela Breakfast Club was hit at 3231 North Clark. Three days later, another ATM was hit at 3352 North Sheffield, police said. Police previously asked people to look out for suspicious behavior such as loitering. Businesses were also advised to install and maintain surveillance systems.